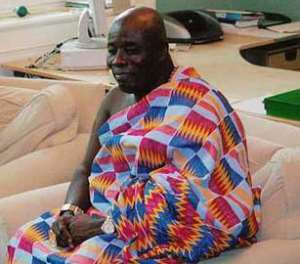 Kyebi (E/R), Dec. 5, GNA - The Okyenhene, Osagyefuo Amotia Ofori Panin, on Saturday kick-started the 12-kilometre Okyenhene's marathon from Asiakwa to Kyebi and took part in a five-kilometre HIV/AIDS marathon walk from Asikam to Akyebi. Over four hundred people participated in the marathon walk, which was organized to climax this year's fourth Annual Okyenman HIV/AIDS Education Week. In a speech after the Walk, Osagyefuo Ofori Panin called on politicians, who would come out as losers in the Tuesday's national elections to graciously accept the results to help protect the peace in the country. He reminded citizens of the country to always remember that in whatever they do "Ghana is first and everything else next." Osagyefuo Ofori-Panin called on all to join the fight against the spread of the HIV/AIDS. The World Bank Country Representative, Mr Mats Kerlsen called for the protection of girls and the respect of the sexual rights of women. The first 20 participants in the marathon walk were presented with cash and goods donated by Cowbell and Spacefon, sponsors of the programme, while all the participants were each presented with a certificate of honour for participation.